I’m so excited for the holidays this year, as this will be the first Christmas that me and Cody will be celebrating as a married couple! We are starting some new traditions as a family this year, which will include a much needed digital detox over the holidays, visiting our extended family and traveling down to Florida with Cody’s family, and of course decorating my home for the holidays. 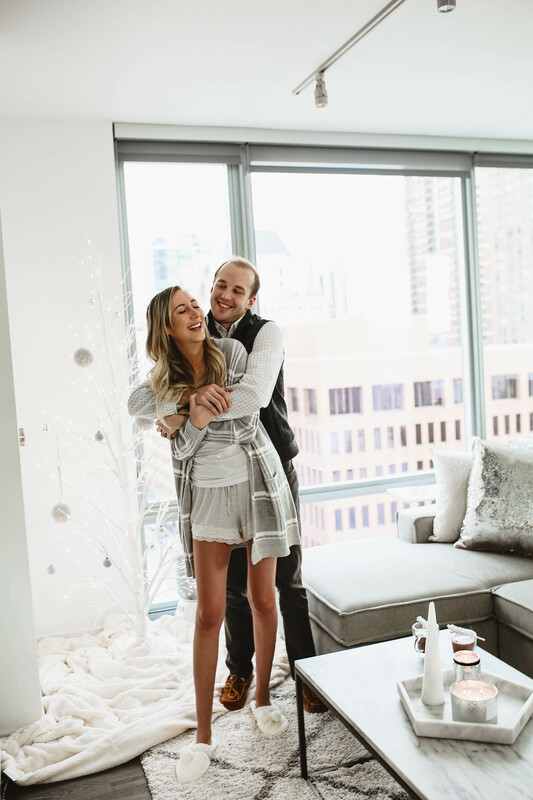 Burlington partnered up with me so I could bring the holiday spirit into my new family home, and I couldn’t be more excited about the results. See some easy tips on how you can add some festive decor to your home below! Want to get into the holiday spirit but still keep up with my aesthetic? Stick with neutrals but with a holiday flare. One of the easiest ways to redecorate is to swap out the finishing touches like throw pillows and candles. I went to Burlington to find my new holiday decor! 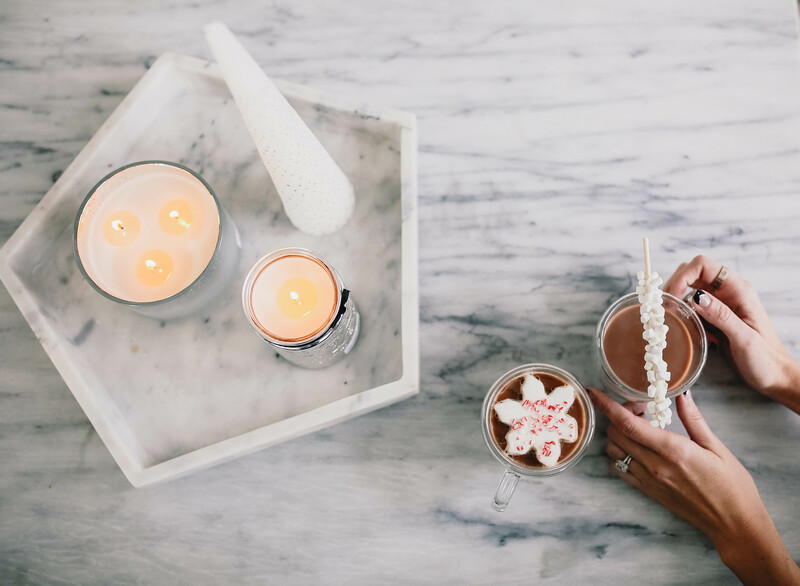 Candles: I got these amazing white Christmas candles that both look great and smell like a winter wonderland, woodsy and warm. Candles always make my apartment feel more cozy, and in the freezing Chicago winter it’s the perfect way to set the ambiance at home. 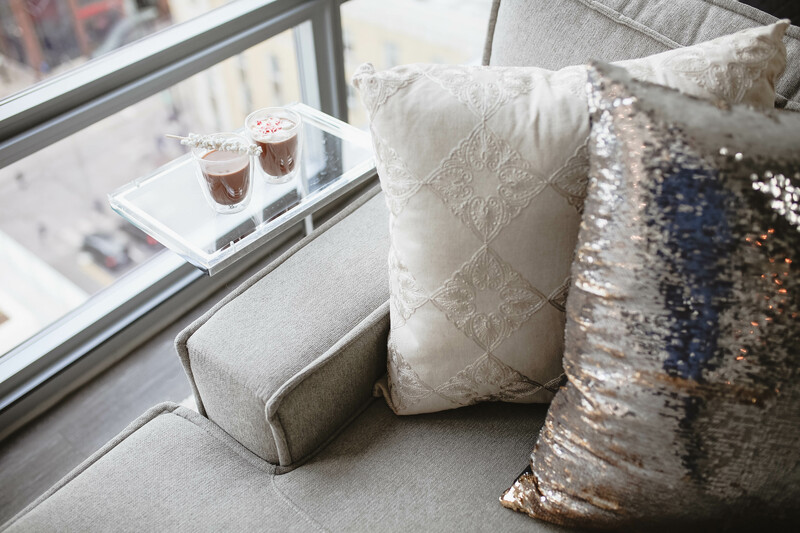 Throw Pillows: I swapped out my usual grey pillows for this sparkly sequined silver pillow and a white pillow with metallic thread. Sparkles and metallics always add a fun holiday twist on your every day decor. Plus keeping with the neutral palette – it easily matches the rest of my apartment including my white Christmas tree and sparkly ornaments! Decorate Your Beverages: I even went so far as to add a little festive element to my holiday decor by adding a little holiday cheer to my coffee. I added a peppermint marshmallow, in the shape of a marshmallow and a rock candy stick to our morning coffee to keep it cozy and make our holiday mornings extra special. Christmas Tree: You know I couldn’t get a normal green Christmas tree, so I opted for this white one that is super minimal. But I added my own touch with sparkly silver ornaments mixed with the white twinkle lights! Because it’s a more minimal look we wanted to add a cozy element so I layered a fluffy white blanket around the base to give it some warmth. The best part is Burlington offers up to 65% off other retailers’ prices every day, which means you can get designer home goods for less. This is perfect for decor that you might want to swap out each season and not break the bank. Each store’s style and selections may vary, but you can get something similar at your local store. Plus part of the fun is seeing what unique finds you can get at your store! Head over to my Instagram where I’m doing a giveaway with Burlington for a $100 gift card so you can add some holiday cheer to your own! ← How To Save Even More Money on Black Friday! Such a cute post!! Love your style, and how you mix modern with girly! Looovvee it! Also, you and Cody are adorable. Brownie points for getting him to take cute couples pics with you!! Where is your clear end table from! I love it!